What Kind of Patio Bar Stool Should You Buy? 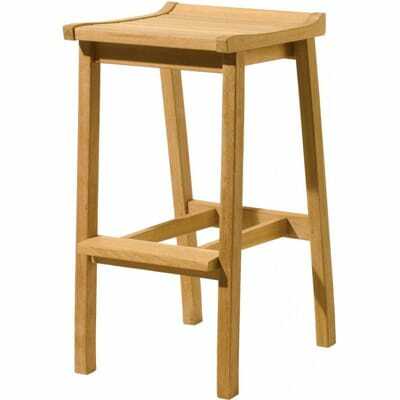 Value - Price is not the sole determinate of value for a bar stool. To determine the full value, we also take into account the materials, quality of construction, design and seat features. Durability - We determine the durability by looking at the upkeep required, type of materials and construction. 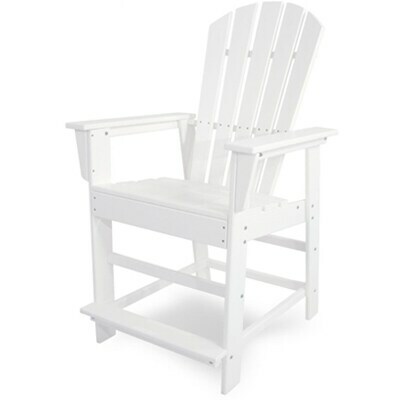 All of our furniture is outdoor rated, however, there are some materials that perform better in the elements and require more upkeep and care than others. Our Guide to Outdoor Furniture Materials and Patio Furniture Cleaning Guides are great resources to find out more. 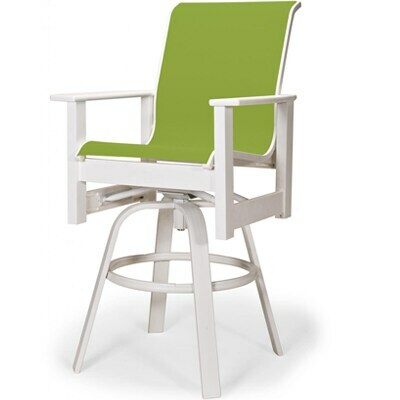 Features - For outdoor bar stools, we look at seat features (swivel, back & arms, etc. ), cushions included (and the fabric) as well as height options (bar height vs. counter height). 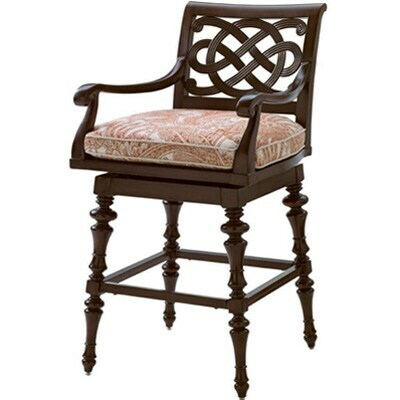 These features are very important for bar stools because they may determine which one is right for your needs as well as add to the value. 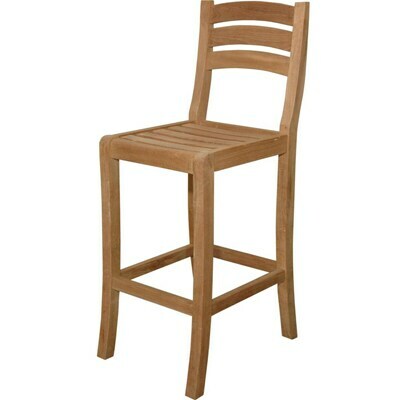 Height - One of the most important factors to consider is the height options for a bar stool. Counter height bar stools have a seat height that ranges from 21 – 27 inches and go with bars/bar tables that are 31 – 39 inches high. 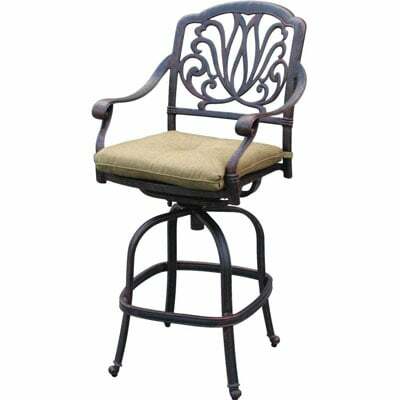 Bar height bar stools have a seat height that ranges from 28 – 33 inches and are needed for bars/bar tables that are 40 – 49 inches high. Some styles have options for both heights. For more information, head on over to our Guide to Outdoor Table and Chair Heights. Cast aluminum is completely solid, unlike extruded aluminum which is hollow, and is made by pouring molten aluminum into molds and then welding the solid pieces together. 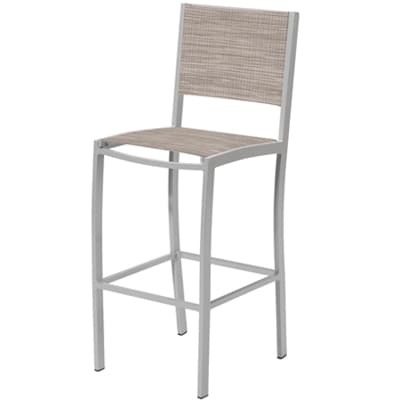 Cast aluminum & aluminum patio bar stools do not rust, are very easy to clean and don’t require a lot of maintenance. 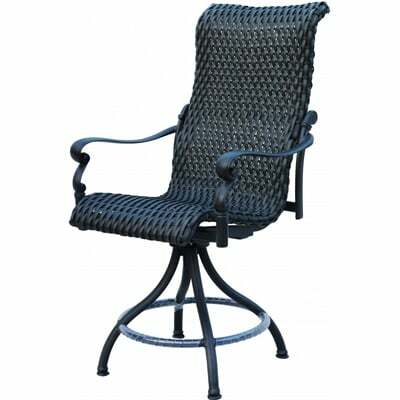 Cast aluminum furniture is sturdy enough that it won’t be blown away by the wind but is still light enough to move around easily. 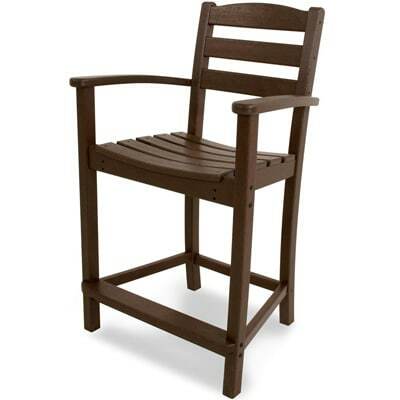 There are many options out there for wicker patio furniture – many different styles, colors and types. All of our wicker furniture is made of resin which is weather resistant, easy to clean, does not absorb moisture and does not split or crack. 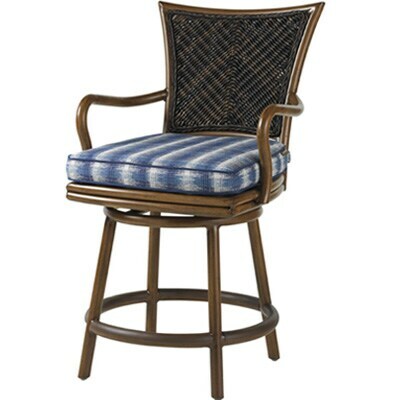 Our wicker patio bar stools are on trend with mixed materials and come in many finishes and styles to match your patio. 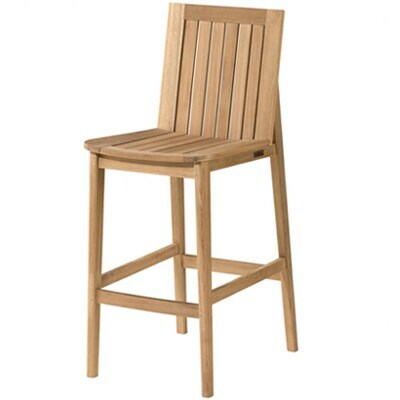 Our wood patio bar stools come in teak or shorea wood. Wood brings a classic feel to any patio and is easy to style. It has the beauty of a natural grain which other materials don’t have. Teak is the most popular type of wood furniture because it is naturally resistant to warping, splintering, bug infestation, rotting and all outdoor elements due to its high oil content. Left untreated, teak will age to a gorgeous silver gray or you can regularly treat your teak bar stool with a teak sealer if you would like to preserve the golden-brown color. 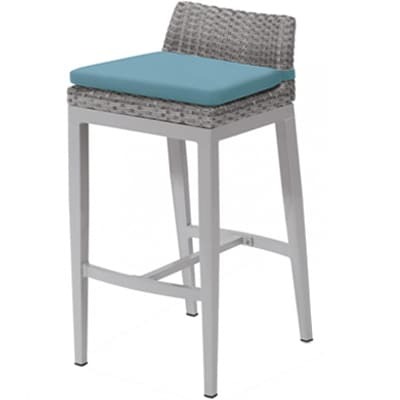 Sling patio bar stools are perfect if you have a pool or want a coastal look. 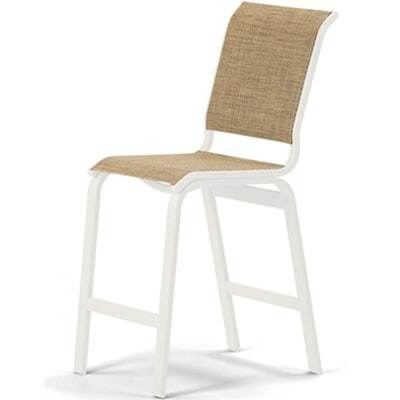 All of our sling bar stools have well-tensioned sling that is durable for everyday use and does not break easily. There are several frame material options to choose from – aluminum, wood and recycled plastic. You can choose from a variety of colors and textures of sling outdoor bar stools to match your patio style. 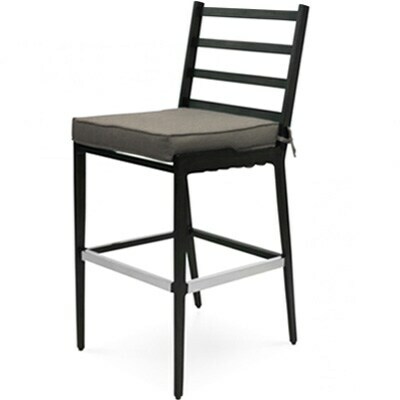 Bar stools that have sling seats don’t require cushions because they provide a comfortable seat on their own. Sling is low-maintenance – it drains easily, dries quickly and is easy to clean. Recycled plastic bar stools are an eco-friendly choice. This material is fade & stain resistant and easy to clean. 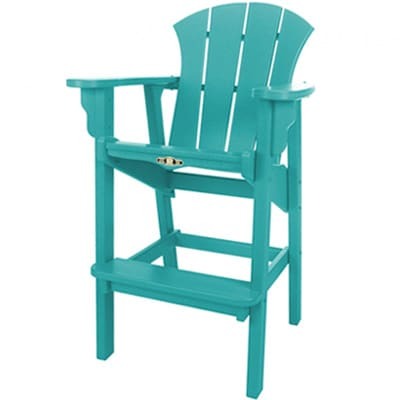 Recycled plastic looks like real wood but is low-maintenance, unlike real wood furniture. Our recycled plastic patio bar stools will last for years to come because they are skillfully crafted with premium materials unlike cheap plastic outdoor furniture. Choose from a variety of fun colors and styles to match your patio.